Wick St. John is a lifetime horticulturist with 30 years of career experience. His encyclopedic knowledge of plants allows him to provide our clients with beautiful and healthy garden plants. His familiarity with the plant market teamed with the imagination of our landscape designers results in gardens full of interesting and often unusual plants. This expanded plant pallet is a facet of our reputation that is attractive not only to our clients but to the talented landscape professionals that make up our team. 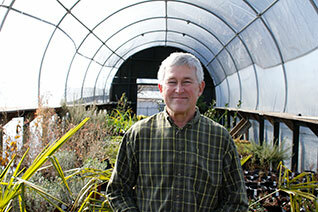 Over his career, he has purchased plants from more than 75 growers and brokers. These established relationships allow Wick to fulfill the wishes our designers’ and consequently the expectations of our delighted clients. After cultivating his interest in horticulture by studying field botany and plant anatomy at Florida State, Wick graduated from the University of Georgia with a Bachelor of Science in Forest Resources. He started his career as a consulting forester and then, perusing his passion for plants, started a landscape construction business of his own. He designed and built gardens for almost twenty years, employing on the average, a crew of four. He has been with our company since 2008. In contrast to his own small business, Wick now enjoys being one of the forty people who share their talents and friendships at the Fockele Garden Company. Wick monitors plant health in the landscapes we install and maintain. He is available for garden plant ID or problem solving on-the-fly when a colleague sends a photo from the field. He specialized in growing and distributing nursery and greenhouse plants for ten years. On the average, the Fockele Garden Company’s greenhouse and plant yard has over 2000 plants including as many as 300 species and cultivars. Though the industry standard and the easiest approach to installing landscapes is to select plants from a short list of popular and readily available plants in the local market, Wick digs deeper to add new plants to our ever-expanding plant catalog. Wick, his wife Angela and their two almost-grown children enjoy a homesteading lifestyle on his Hall County farm near the headwaters of the Oconee River . He enjoys sport bikes, music and watching documentaries. Many of our clients not only appreciate the beauty of their landscapes but may also have an academic interest in species and cultivars- or often want their garden to be a place where they can exercise their own green thumb! Wick serves as a resource for some of our client plant enthusiasts.